When M. M. arrived in San Diego in the late 1880s, he soon met a young school teacher named Lila. After a simple marriage ceremony, they bought a parcel of land bordering the San Luis Rey River near Pala and, in partnership with his brother, W. A., began building a grist mill. Millstones were ordered from France; and, after a long sea voyage around the Horn, the stones were loaded on wagons and hauled by mules through Escondido to the mill site. 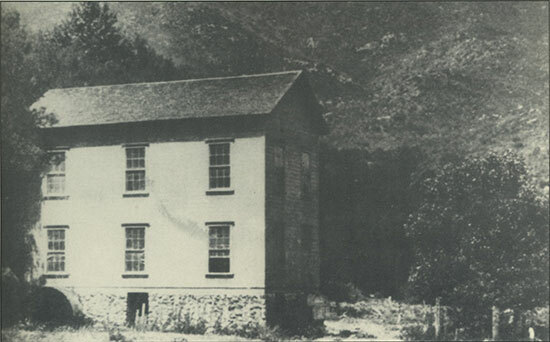 The mill provided the Sickler brothers a good income for many years. Most grain shipments arrived by wagon from Temecula Valley in Southern Riverside County. It was customary, typical of the miller trade, for the Sicklers to retain an agreed-upon percentage of the ground flour as a milling fee. Sickler Flour Mill at Pala as it appeared in the late 1910s. Built by M. M. and A. W. in partnership. Courtesy Fred and Vera Sickler. By the early 1800s, indigenous Indians had found pink and green tourmaline [italics in original] in areas known early-on as Pala, Rincon, and Mesa Grande. A few tourmaline arrowheads had been discovered in old Indian burial sites, but natives apparently made no effort to locate sources of the pretty stones, being content to collect gems found lying about on the surface. 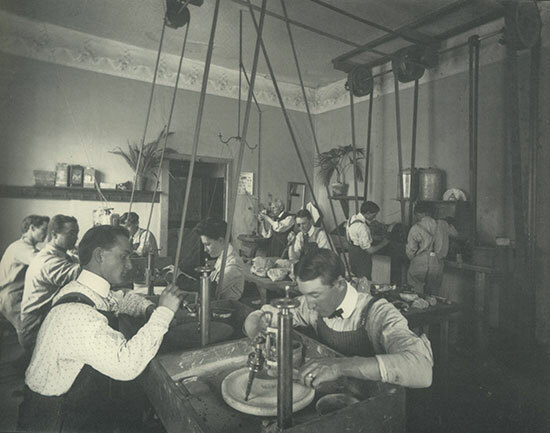 M. M. knew of the Indian discoveries and, by the late 1880s, had begun to devote considerable time to searching for gemstones. Gem-bearing veins in San Diego County are called pegmatites, a whitish rock composed primarily of feldspar, quartz, and mica. 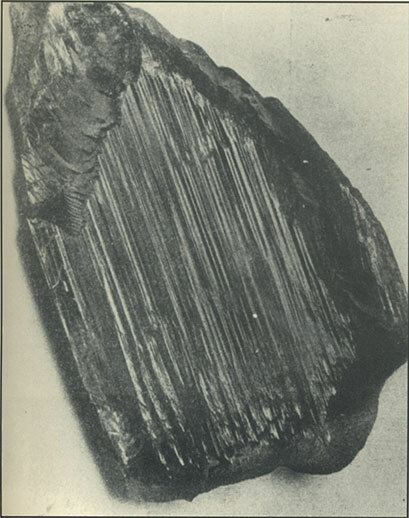 Pegmatites are frequently streaked with dense black tourmaline, which unfortunately has no commercial value. North County pegmatites typically strike from southeast to northwest in a region that is semi-arid with little rainfall and but sparse vegetation. Wherever a pegmatite vein surfaces as an outcrop, it is easily seen on the brown mountainsides. Prospectors search the decomposed rubble of pegmatites for such “encouraging signs” as the occurrence of clear quartz crystals, crystallized feldspar, and larger sheets of muscovite, a white mica. But, when bits of lavender-colored, granular lepidolite are encountered, valuable gemstones may be nearby. 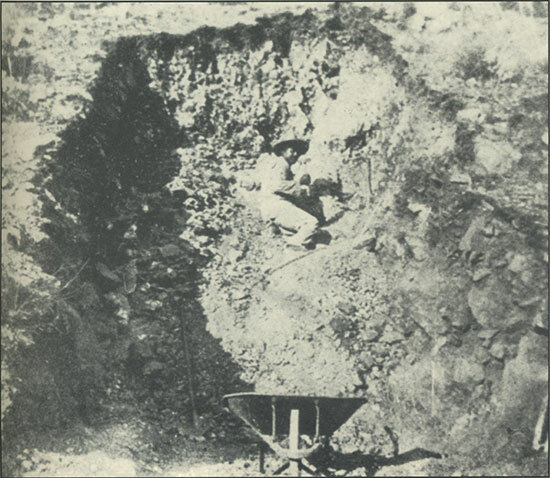 Only a few of the many hundreds of pegmatite veins coursing across the North County ever produced gemstones, but optimistic prospectors carefully inspected each discovered vein anyway. A magnificent 24 oz. 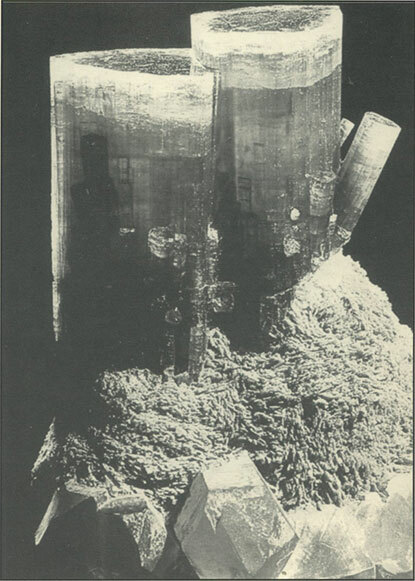 kunzite, reported in the press as being 7" high. Courtesy Tiffany & Co., New York. Marion Sickler had made a study of pegmatites and found small deposits of quartz crystals and pink tourmaline. But it remained for his young sons, Fred and Allan, to make the first really important discovery. Official San Diego County records (now housed in the San Diego Historical Society facility in Balboa Park) show the entry dated June 14, 1901, in which Fred Sickler filed his claim. Only three other gem claims in the Pala area had been filed before Fred’s: the Lithia King [boldface in original] mine, filed on September 28, 1898; and the Douglas and Little Mildred mines, filed on March 10, 1899, all by Frank A. Salmons. Later, by 1915, Salmons was to file claims on the Pala Chief, Pala King, and Tourmaline Queen mines. Specimen tourmaline crystals, 8" high, from Pala King Mine (ca. 1908). Courtesy Smithsonian Institution. Interestingly, to advertise his mines, he built a large structure, housing within it the facsimile of a gem mine, on the east side of the grounds of the 1915 Panama-California Exposition in San Diego’s Balboa Park. He named the building the “Pala Chief Mine,” which he faced with tons of purple lepidolite, quartz, and feldspar, containing kunzite and tourmaline. Marion Sickler’s White Queen immediately produced good quantities of pink tourmaline, large quartz crystals, pink-colored beryl crystals known as morganite (after the New York financier, J. Pierpont Morgan), and some small, lilac-colored crystals of a then unknown variety of gemstone. Proceeds from the White Queen augmented the Sickler family income, but the total amount of cash received from sales barely offset mining costs. 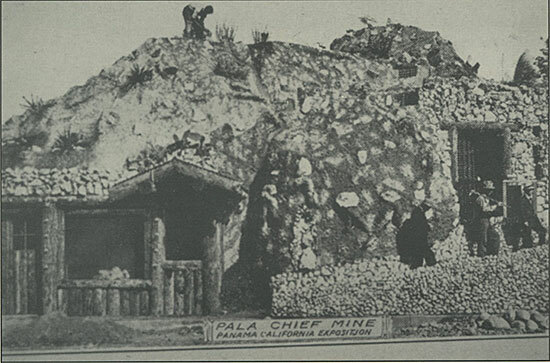 Frank Salmon’s “Pala Chief Mine” exhibit at San Diego’s Panama-California Exposition. Courtesy Bill Larson. 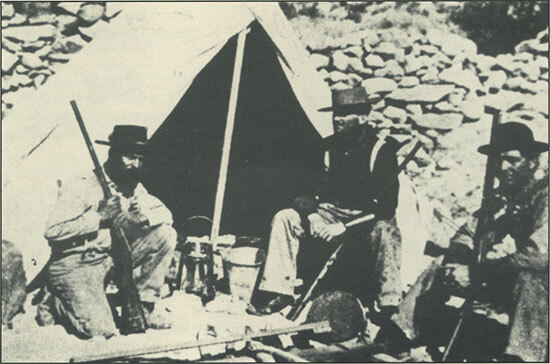 Guards, Pala Chief Mine, early 1900s. Courtesy Beulah Rynerson. Unlike metal are deposits found elsewhere, which may have uninterrupted veins of ore extending a mile or more, San Diego County pegmatites are generally shorter than a few hundred feet long and quickly become barren of gems at a depth typically of one or two hundred feet. Gemstone mining is quite difficult, because the gems are usually found in isolated pockets along the dike and have to be extracted carefully by hand. There is no scientific way to determine just where the next pocket might be, if one exists at all, and mining in hard rock is a costly, time-consuming process. Thus, most San Diego County gem mines never paid expenses. In spite of these shortcomings, M. M. and his sons became addicted to prospecting. Within the next few years, they staked out six more claims in the Pala mountains. M. M. filed the Katerina mine on April 22, 1902, the Vanderburg on April 29, 1902, and the Lookout on January 19, 1905. Young Fred filed the Heriart on January 29,1903, the K. C. Naylor on January 4, 1904, and the Affiant (with his father) on January 19, 1910. Allan Sickler refiled the Lookout on January 25, 1907. 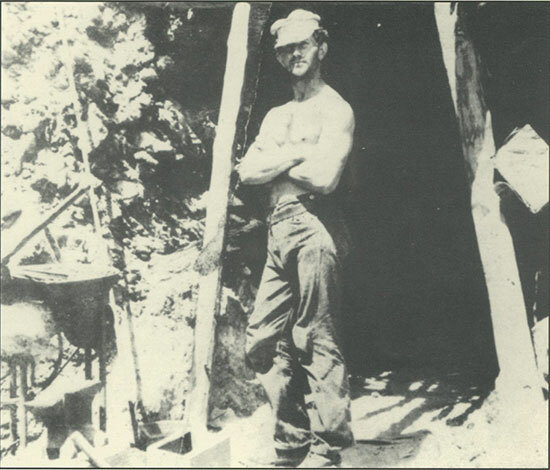 Fred Sickler Sr., at the Heriart Mine, in his early 20s. Naylor Mine on Heriart Mountain, Pala (1905). 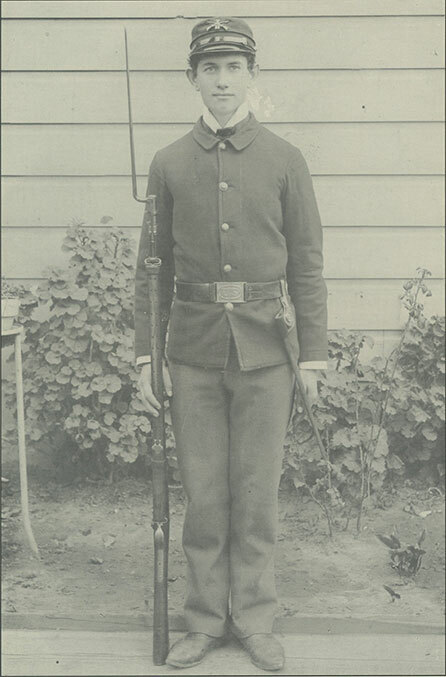 Fred Sickler Sr., as a California Militiaman (ca. 1890s). Photo taken at grandmother’s house, 6th and Palm, San Diego. Courtesy Fred Sickler Jr.